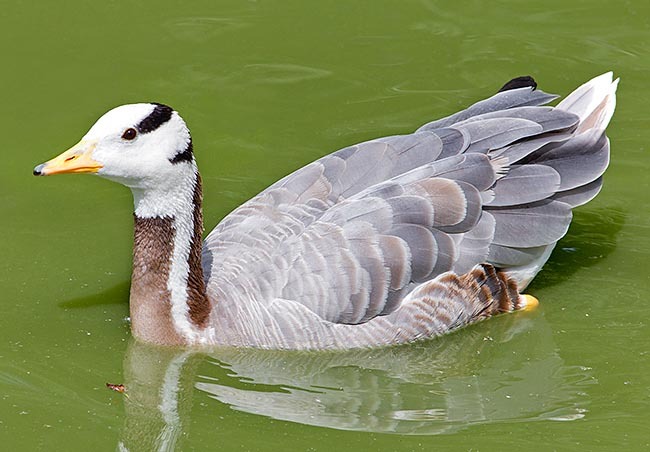 The Bar-headed goose (Anser indicus Latham 1790) belongs to the order of the Anseriforms (Anseriformes), to the family of the Anatids (Anatidae), to the genus Anser and to the species Anser indicus. The name of the genus “anser” comes from the Latin and simply means “goose”. The name of the species “indicus” means “Indian” in Latin. 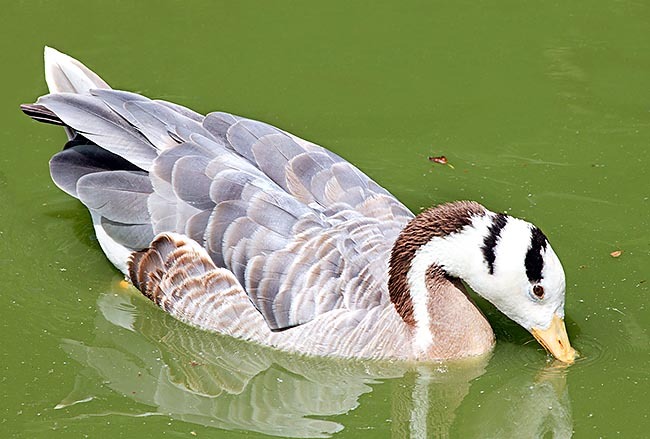 The bar-headed goose is native to central Asia (south-eastern Russia, northern India and western China) where nidifies, at the level of central highland, close to the mountain lakes. It flies, performing one of the most spectacular migrations done by a bird, beyond Himalaya for spending the winter in India, Assam, northern Burma and n Pakistan. Most of the winter foraging areas have presently become cultivated. The bar-headed geese graze therefore on fields presenting stubble of rice, barley, wheat. But, on the other hand, they may also cause damages to the buds of the same crops when these are in the stage of growth and cultivation. Migratory species, it gathers in huge colonies for reproducing on the grassy shores of the mountain lakes where it finds the food necessary for growing its own young. Goose with elegant and pretty appearance, the bar-headed goose has an average weight varying between the 2 kg scarce and the almost 4 and has long wings. 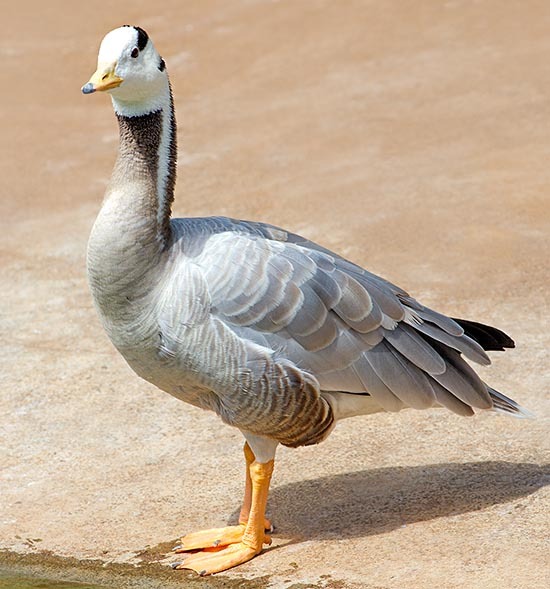 The name of bar-headed goose comes from two characteristic dark bars, of brown-black colour, standing out transversally on the head which, for the remaining part, is white. Overall, this species has a silvery grey-pale colour. After the snow geese (Anser caerulescens) and the Ross’s geese (Anser rossii) it is the palest Nordic goose among the extant 15 species. The head, the chinstrap (abundantly up to the beginning of the attaching of the neck) and a pointed stripe prolonging medially on each side of the neck are white. The neck, under the white chinstrap and more extensively at dorsal level, is shaded of brown and is darker than the underlying degrading pale grey of the chest and of the back. These brown shades are found, more or less extended, also on the most distal feathers of the sides. The remainder of the body is pale grey, slightly more intense on the back, and the feathers have some slight paler margins (more on the dorsal part of the livery). The undertail and the lower abdomen are white. Also the rectrices have tonalities fading in pale grey, as well as the underwing but the remiges which are dark-blackish. The distinctive horizontal black bars of the head are typical of the adult specimens. The paws have a nice rather pale and luminous orange colour with dark nails. The bill is orange yellow with dark apex. The eyes are brown. The rather thin bill, along with the nice drawing of the head and the eyes, reached by the most distal black line, do confer this goose a very elegant and refined look. The young have wide bars, shaded and not defined, with the vertex of the head and the neck, especially on the back, with grey-brownish hues. A wing area slightly bigger if compared to the own sight, in respect to the other species of wild geese, allows this species to perform exceptional migrations. 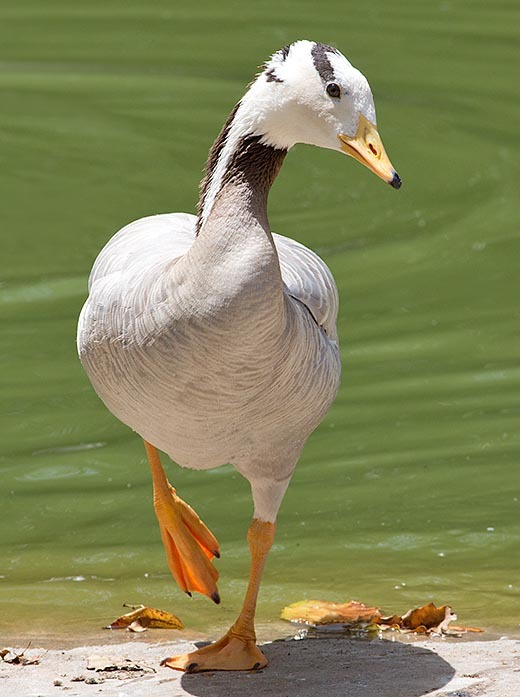 The bar-headed goose, in fact, normally flies over the Himalayas passing even over the Mount Everest at 9000 and more metres of altitude. Probably, these geese fly over the highest peaks avoiding the mountain passes at lower altitudes in order to avoid sudden turbulences and strong air currents rightly avoidable by flying at high altitudes. The Himalaya might not have always been the incredible present barrier for the migration of the bar-headed goose; the migratory track might have been defined before that the mountain range reached the present altitude. The peaks of the summits which have continued in growing up have meant that the geese, as adaptive strategy to the problematic, have simply continued in flying higher and higher thus becoming one of the species of birds flying at the highest reported altitudes. The species has crepuscular and nocturnal habits. Highly gregarious species, during the period of wintering as well as during the reproductive season. It rarely mixes with other species; has timid and wary nature much more in winter especially due to the hunting to which the species is subject. In the places where the bar-headed geese are left in peace, they tend to become more confident, especially in the meeting locations for the reproduction. These geese even if they reproduce at medium latitudes, they nidify at so much high altitudes that their places of nesting are, from the climatologic point of view, equivalent to those of species nesting at much higher latitudes. Known also as “mountain geese”, the bar-headed geese reproduce up to 5000 metres of altitude on the highland of central Asia being the largest colonies present in Tibet. Other specimens nest in Kashmir. The bar-headed geese move to the mountains, for nidifying, in March-April following the advancing of the spring thaw and going in the nidification places in early May when the shores of the lakes are free from the ice. The nests are placed on small islands little higher than the level of the water or flooded at times. Sometimes new nests are built on precedent flooded ones containing gone lost eggs. These geese can nest high, in respect to the level of the soil, utilizing old nests of hawks and crows or tops of broken tree trunks. This species tends to reproduce in colonies which may count thousands of specimens. The bar-headed geese, in order to get some protection from the terrestrial predators, at times nest in the territories defended by pairs of upland buzzard (Buteo hemilasius). In any case, the nests can be predated, even intensely, by corvids, birds of prey and foxes. In nature, the average hatching is formed by 4-5 white eggs, even if there are reports stating hatchings counting up to 8 eggs. The incubation, done by the female, lasts about 27-30 days. The ducklings, carefully attended by both parents, are clear with upper parts of pale grey colour and lower parts whitish shaded in yellow especially at the level of the head; their small paws are grey-greenish and the bill is greyish-fleshy. The bar-headed geese begin the moult when the ducklings hare about 3 weeks old and as soon as the young are fledged they begin to move among the various available mountain lakes. The flocks begin to reach the wintering territories, in India, by mid October, but other specimens remain in the reproduction sites until when the lakes begin to freeze; usually by early November. The main wintering habitats of the species are the swamps, the lakes and the plain rives of northern India; and from this has come the Latin name of the species. Finally, small flocks of geese, remain to winter in the southern part of the reproduction area, that is, in the southern valleys of Tibet. The bar-headed geese feed of aquatic plants, sedges and lawn grasses, larvae of insects. The number of the specimens belonging to this species has been remarkably reduced, mainly during the last century, due to the strong venatorial pressure. The decrease has been particularly intense in India. In Tibet, the species is protected (as done for the other animals) by the Tibetan Buddhists but this does not preclude the fact that the eggs are in any case collected for being sold. The Russian sub-population has decreased and has settled on the 1500 specimens. The Chinese population, with about 10.000 nesting pairs, is more lively. The overall population, maybe presently increasing, has been recently estimated to amount to about 50.000 specimens. This goose, beautiful and elegant, is much appreciated, esteemed and bred by the aviculturists of the whole world. → To appreciate the biodiversity within ANSERIFORMES click here.